The 7PPU style locking system has a 7 pin tumbler system incorporated for superior security that pops up. Locks are secured with solid steel pins for greater protection and tamper resistant security. Bag cannot be locked without key which would prevent a person from locking the key inside bag by mistake! 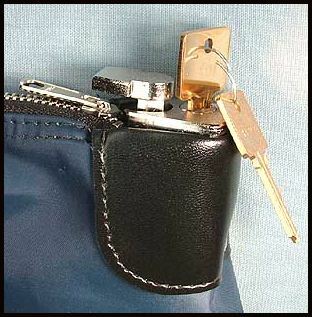 This style locking system is not as popular in certain applications because it requires the person interacting with the bag to have the key to lock the bag. Keys allocation should always be considered! The 6PPU style locking system which is most popular by far has a 6 disc tumbler system that pops up. This lock has a pop-up swivel plunger for easy maneuverability. The key can be removed while lock is in open position. This would allow you to give the bag to an individual with the bag totally open, than this person could enter contents, close and lock the bag without having the key. 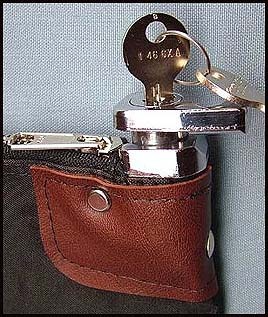 This would be an excellent choice for use in a system where keys are not always issued with the bags. Top of lock (pop-up) swings 360 degrees when in open position and then you press down hood after you zipper the bag closed to lock bag. As stated above this bag can be locked without having the key! Locks are secured with solid steel pins for greater protection and tamper resistant security. 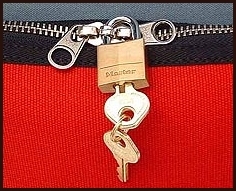 The DSPDL-1 locking system uses a padlock to secure the bag. 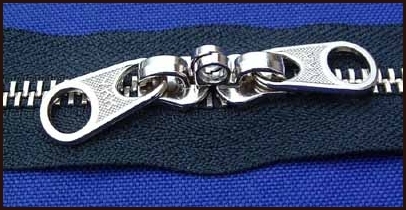 The two sliders come together as shown in pictures above to form one metal loop which allows you to place a padlock through this which locks the bag. You can get padlocks "keyed alike" or "random keyed". You can also place a nylon/plastic security seal if you do not want to use padlocks. These CCBWS bags are very popular and are custom made to order. All stock bags come with a framed window in which you can insert an ID card. Bags shown here have the DSPDL-1 locking system and can be made with a non-locking zipper as well. 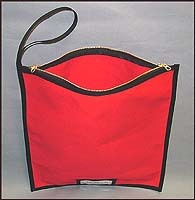 Collection bags can be made in many colors and bags can be personalized as an option. The two embroidered offering bags here measure 16 inches wide by 18 inches high. The handles make it easy for transportation and also serve very nicely to spread the opening wider when dropping collection devices into them. They can be made in a variety of fabrics such as: #8 COTTON DUCK, CORDURA, BALLASTIC NYLON & COATED POLYESTER These bags are priced according to size and material selected. They range from $30.00 - $45.00 and any optional embroidery will be priced based on stitch count and detail. Please inquire with any special needs you may have. This ECC-1814 style bag is made from durable and rugged Cordura nylon. It has two separate handes which carry like a briefcase. This also aids in filling bag with contents allowing you to hold handles and pull apart making the bag zipper opening wider. 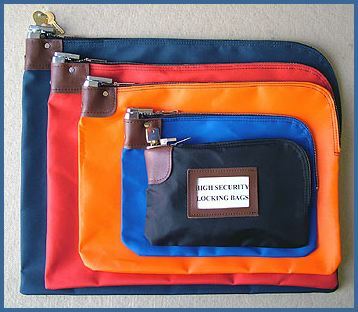 The bag comes stock with framed larger window and has the 6DPU high security locking system which is described below. This bag is available in 13 different colors which may be helpful for color-coding. It has heavy gauge vinyl sewn around bottom of bag for extra strength. 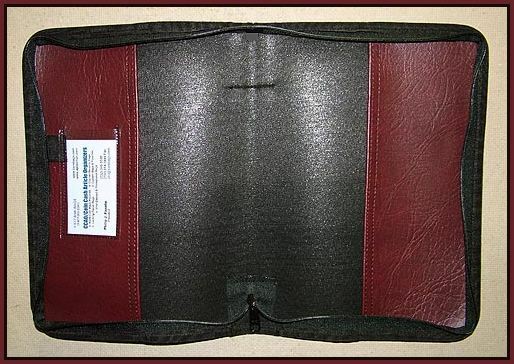 Bag shown here measure 18 inches high by 14 inches wide with a 4" x 10" bottom. The is avaliable in 4 different stock sizes and can also be made to any desired size to tailor fit your needs. Bags can be screen printed or embroidered also. These bags range from $35.00 to $70.00 depending on selected size and options. These extremely popular style bags are a high security locking zipper bag. Bag shown here is 20"w x 16"h. They are a larger version of the same bags that have been used in the banking industry for years as night deposit bags. 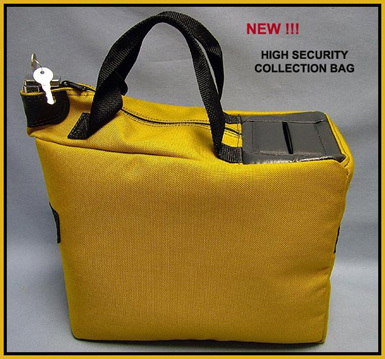 The smaller versions of this bag are great for drop boxes and safes! You can also use the smaller sizes of these bags for collections and put them into a larger bag of this style or one of the other larger bags that we produce. This bag has the locking mechanism incorporated right into the bag. There are many options regarding keys and key control. These bags come in different sizes and are an ideal choice for emptying collection baskets, bags, and boxes into because the bag has a very wide opening since the zipper travels around the outside corner of the bag. Bags can be screen printed or embroidered also. These bags range from $16.00 to $35.00 depending on selected size and options. 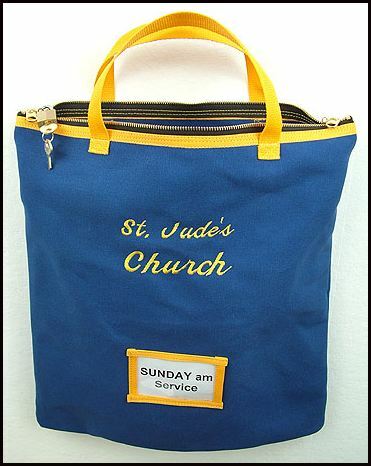 We manufacture many different fabric bags in endless colors, shapes, and sizes for the money/cash collection process that any church may use. We have a stock line and produce custom bags as well. 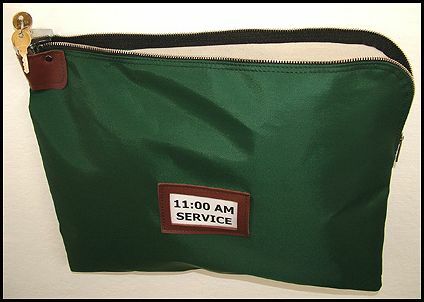 We can personalize any bag (s) with either screen printing or embroidery. Below are some of the more common bags used for the collection and transportation of offerings that are gathered from any given service. 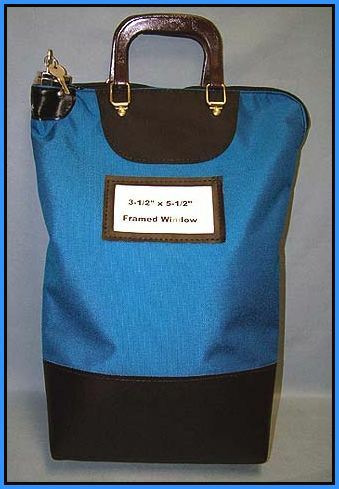 Most all bags come with a sewn on framed window that is very useful to identify the contents of any bag. In addition to the removable identification label/card, you can also color code the bags. 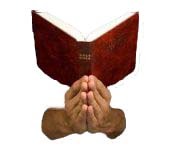 This is useful for religious establishments that may have multiple services in any given day or week. These CCBWH bags are also very popular and are custom made to order as well. All stock bags come with a framed window in which you can insert an ID card. 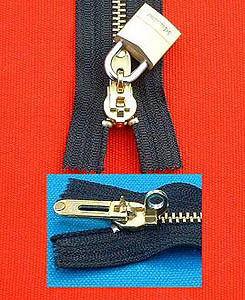 Bags shown here have the DSPDL-1 locking system and can be made with a non-locking zipper as well. 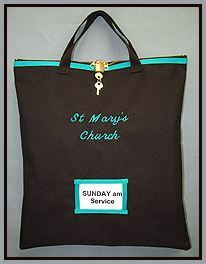 These offering/collection bags can be made in many colors and bags can be personalized too. The bags here measure 16 inches wide by 18 inches tall. They have a handle/wrist strap sewn on one side for ease of transportation. They can be made in a variety of fabrics such as: #8 COTTON DUCK, CORDURA, BALLASTIC NYLON & COATED POLYESTER These bags are priced according to size and material selected. 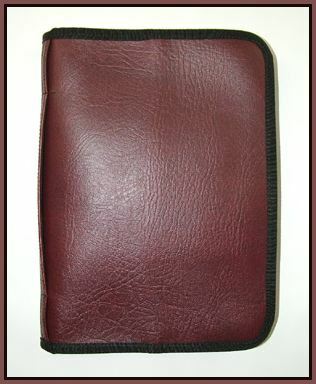 They range in price from $18.00 - $25.00 and any optional embroidery will be priced based on stitch count and detail. Because of the WIDE array of bags we produce, as well as countless sizes and options, we find it would be almost pointless and confusing to try and list pricing for all bags. PLEASE PICK UP THE TELEPHONE AND CALL US ON OUR TOLL FREE NUMBER FOR MORE HELP, GUIDANCE & PRICING - THANK-YOU!!! This bag is new and could change the way you presenlty collect your offerings. It could not only streamline and make the process more efficent but also add a whole new level of security and accountablity to this whole process. Many churches that have implementted this system found that it even increased offerings because of the obvious integrity. For further information, larger views and more detailed information please click HERE or click on the image itself.